I sat down with Quantic Dream’s Heavy Rain on Wednesday, and by Friday, I was completing one of the most unique games that I have every played. I had never felt so emotionally invested in the characters and plot in video game. The characters look, behave, and talk like real people, and there is virtually no user interface to remind you that you are interacting with virtual characters. But it’s the interaction with these characters more than the characters themselves that involves you in the story and ties your emotions to the characters. 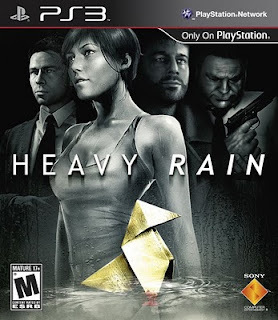 The only thing that Heavy Rain lacks is immediate replayability. Playing through the game again would be a lot like watching an emotional impactful movie repeatedly; the impact would be blemished, and on top of that you’d likely experience a slightly different story with Heavy Rain. Personally, I can see myself coming back to the game in a year and enjoying it all over again. I’m going to keep this short. Heavy Rain is superb. Quantic Dream has managed to blend cinema and interactivity in a truly unique and compelling way. It’s a worthwhile experience to say the least, and to say much more than that would diminish my experience with the game (or spoil someone else’s). I guess it is time to get my UK account back active to play the demo. If you like the demo, you should rent it. You could probably experience the game in its entirety in a few days.